Steve Seminario, VP of product marketing for Leyard and Planar, talks video wall sales. Very often, the most traditional video walls are the most effective for a particular customer’s needs. However, that doesn’t mean that video walls sales conversations ought to start with from the traditional, rectangular standpoint. In fact, says Steve Seminario, VP of product marketing for Leyard and Planar, it’s helpful if an integration firm sales professional helps the customer push the boundaries a little bit. In some cases, customers enter the sales cycle with creative ideas and ambitious video wall design goals. “Other customers have a preconceived notion of what’s possible and they’re thinking in terms of flat rectangles,” Seminario says. 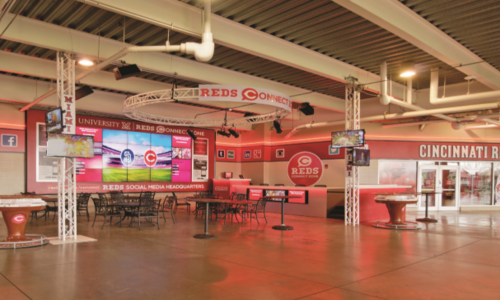 LED display technology has opened up options around video wall design and configuration – and many customers might not be aware of the possibilities. “There really is a lot of creativity you can build into your space for corners, curves or ceilings [and] Interactive walls,” Seminario says. Creativity is likely to become even more important when it comes to video wall design. A recent CI Research survey shows that demand for video walls by corporate customers is sharply on the rise. Both education markets are also seeing significant growth in demand for video walls. These corporate and education customers will be faces with the challenge of creating designs that stand out. If they’re willing to invest in a video wall for communication or branding, they’ll most certainly want to make sure that it’s attention-grabbing enough to deliver ROI. The integration firm sales professional will play a critical role in helping customers to think beyond the rectangle when it comes to video walls.